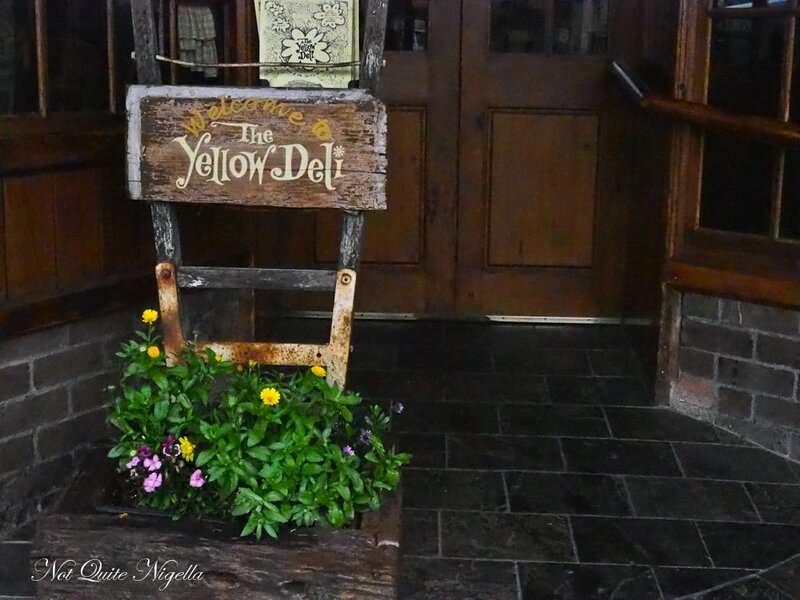 Every time we go to the Blue Mountains we want to go to Yellow Deli but it is always closed on a Saturday. But then we had to meet my friend Lulu and her daughter Evie on a Sunday and it seems like the perfect time to visit the intriguing little cafe! 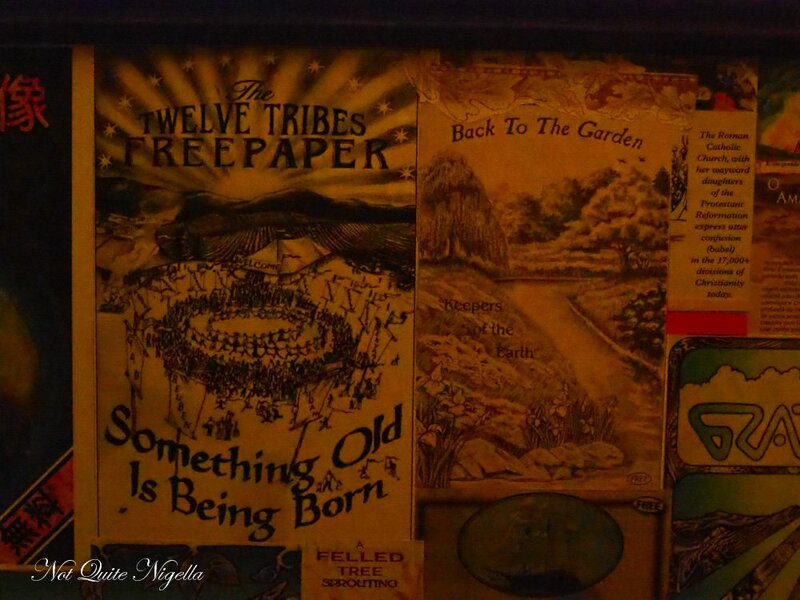 I had actually been to Yellow Deli before when it was called Common Ground. 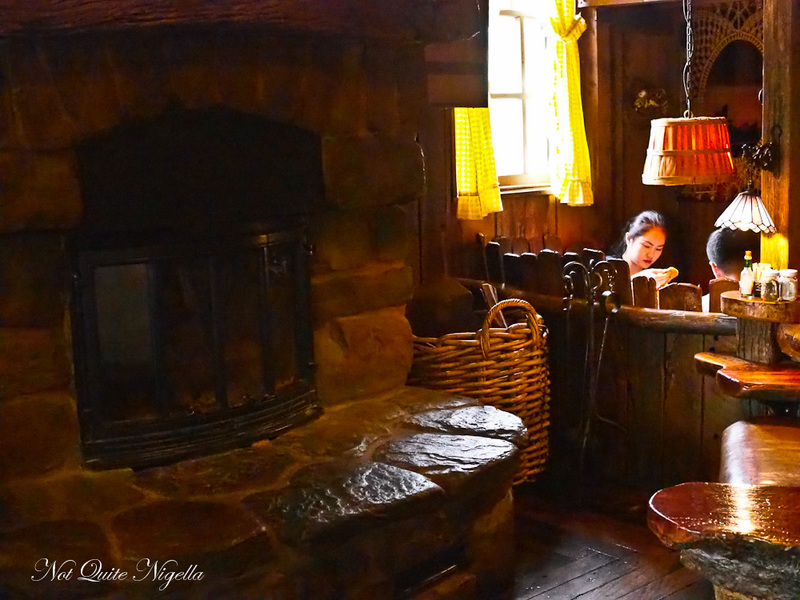 Not much has changed from the Twelve Tribes religious community that owns it to the stunning interior that looks like it came straight from Hobbiton. Twelve tribes is a religious community who follow Master Yahshua (the Hebrew name for Jesus). They live together like an extended family at Balmoral House just near Katoomba Station. The members dress quite similarly and are very calm and it seems nothing fazes them. They're open about their religion. If you want to learn more, there's walls covered with articles on the way to the bathrooms. They don't hide it but they also don't try to convert you. We are sitting outside because we have Mochi with us but as its unseasonably cold, we are wedged between two heat lamps so nobody is bothered. It's nudging about 9C on the temperature so warming dishes appeal the most. The food here is excellent although it's not what I exactly picture when I think of a deli. If I lived in Katoomba I'd be here often because it's like home cooked food done really well. Prices are also really, really good. 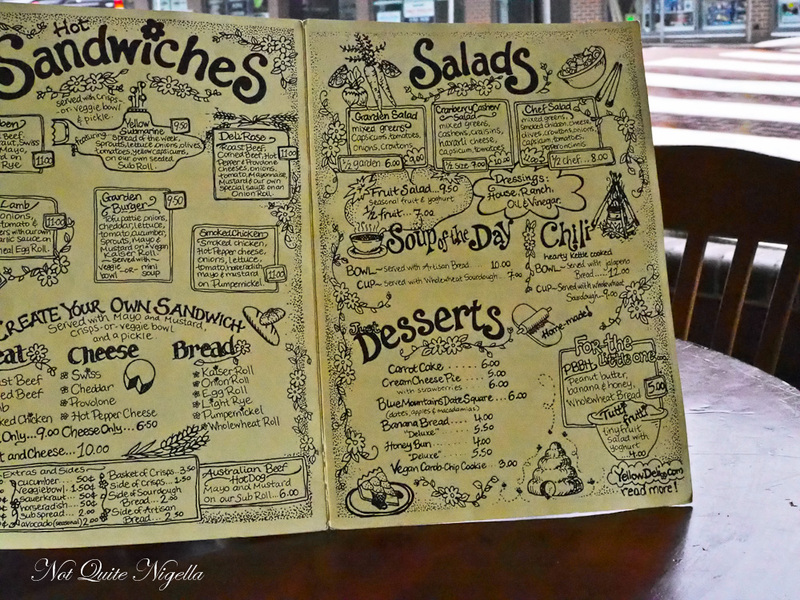 The menu is hand drawn and on the hippie side, and reminds us of Mr NQN's very alternative mother's' illustration. 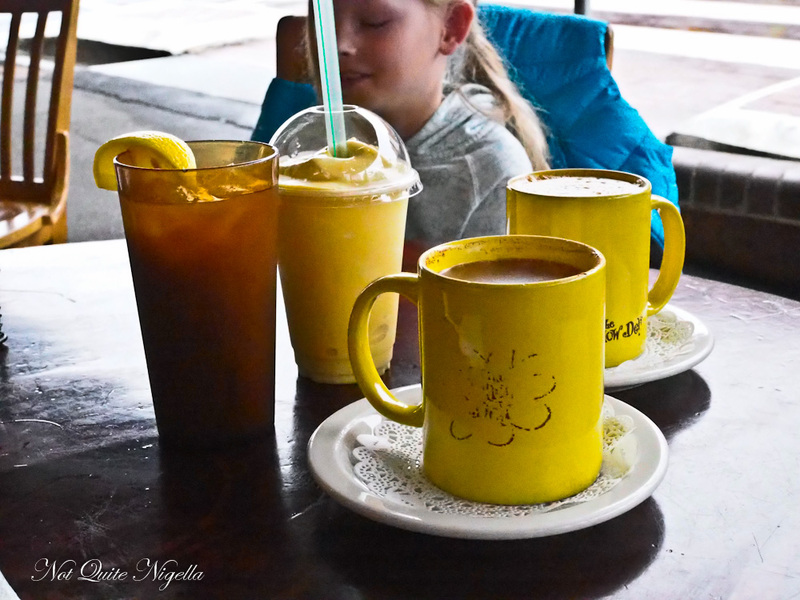 Our drinks come first, a hot apple cider for me which really warms me up. Lulu has a skim flat white while Mr NQN tries a mango mate tea. They're big on the South American tea mate (pronounced mah-tay) which is normally quite bitter. This version is served with mango juice so it isn't bitter at all, it's quite nice and really tastes like a mango juice with the slightest hint of bitterness. Evie orders a thick and rich mango smoothie. Evie is fascinated with Mochi. Ever since we adopted her she and her sister have asked for photos of Mochi. "She's my dream dog," says Evie before asking mum Lulu if they can have a pet. The topic turns to getting a cat, specifically a cat called Cate Blanchett. Our food arrives and I am a huge fan of the pumpkin soup. 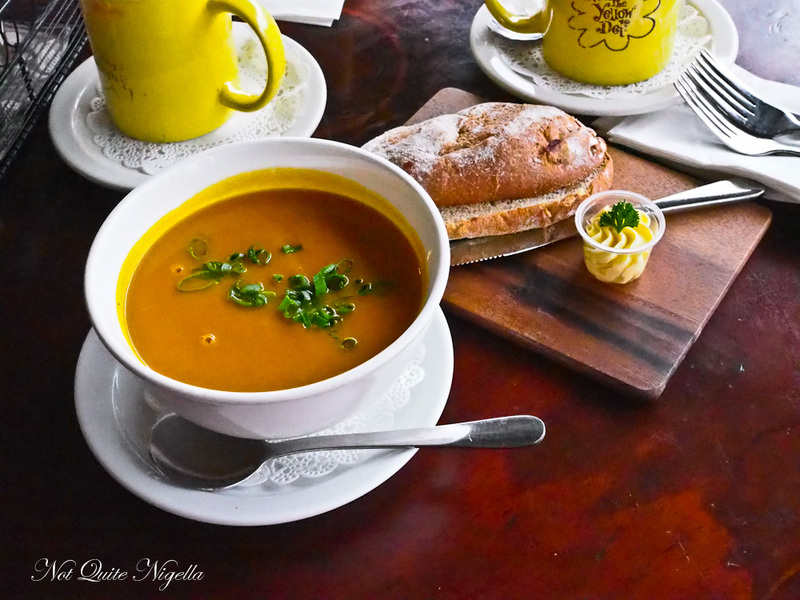 It's pretty much my perfect pumpkin soup bursting with flavour and spices. It isn't too thick or creamy and it tastes like sweet pumpkin. It comes with a wholemeal roll, served warm with a butter rosette. 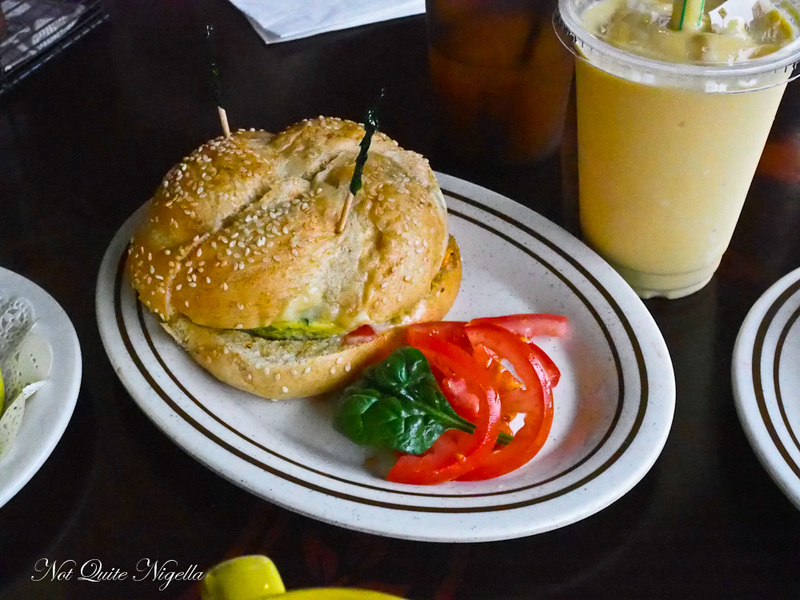 Mr NQN has a spinwich sandwich from their all day breakfast selection. Inside there's a fluffy herbed egg omelette, parmesan, cheddar, hot pepper cheese, onion and capsicum on a buttered egg roll. I have to admit that the buttered egg roll totally captivated me. Evie orders the cream cheese pie with strawberries (you can also have this without strawberries). 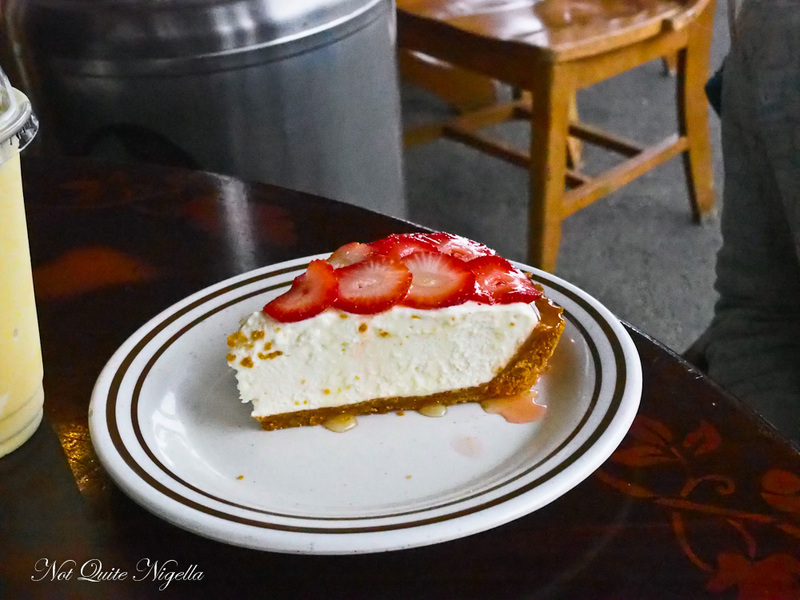 It's a light and fluffy cheesecake that has just enough richness without being too cloying. There's a nice thin crust on it too which I like. Actually when you go inside there are a lot of their own bakery items and they're fantastic. 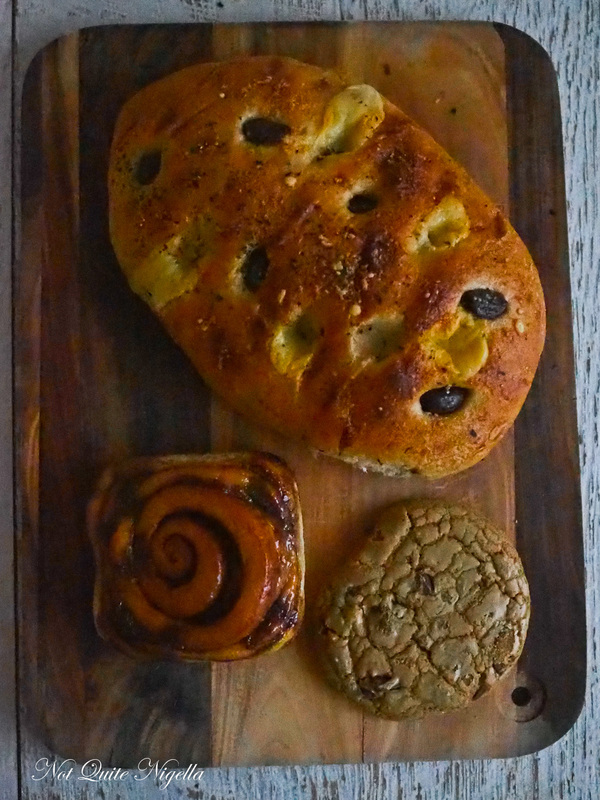 We bought a few things to go including a fantastic focaccia, a soft, chewy vegan choc chip cookie (a bit too sweet for me and perhaps needs vanilla) and the prize of them all: a saucy, syrupy cinnamon scroll. I heat it up and eat it for a late dessert once we arrive home. So tell me Dear Reader, does being tied to a certain religion make a difference to visiting a place? 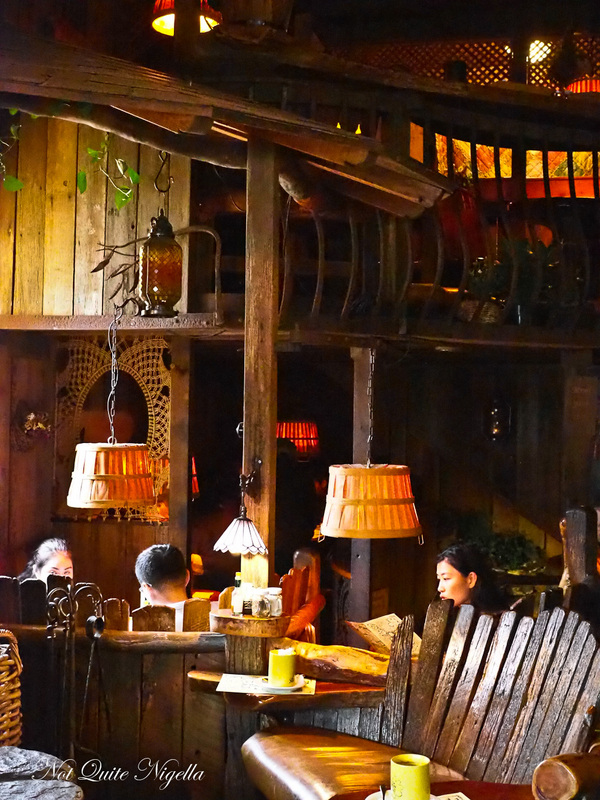 Have you been to Yellow Deli and if so, what did you think of it? 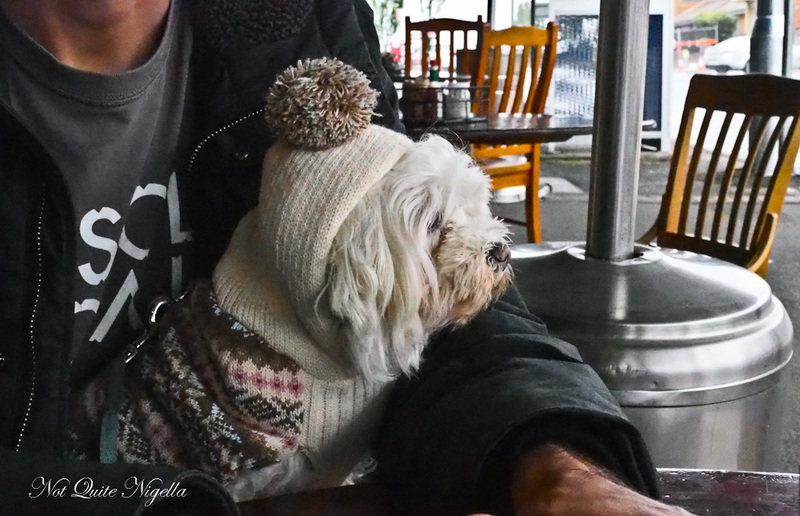 featureCommon Ground Cafe, Katoomba - A Most Unusual Cafe! 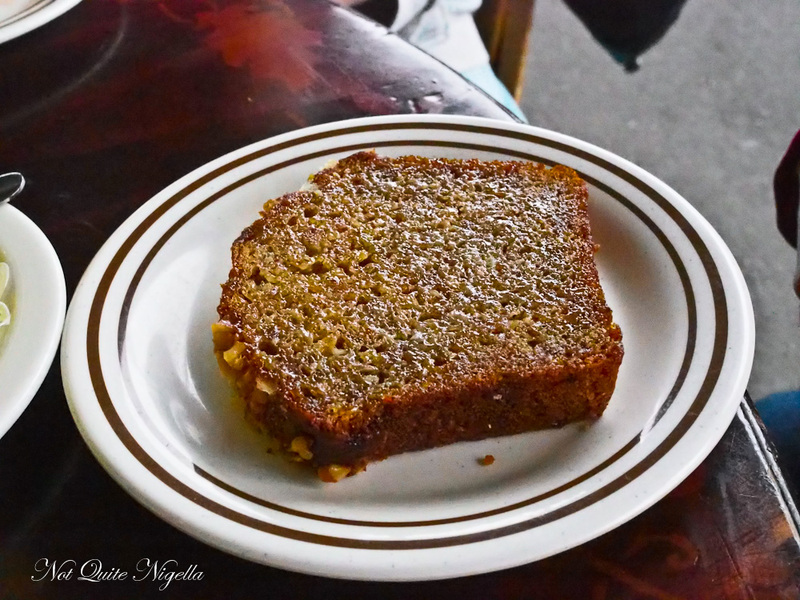 feature Common Ground Cafe, Katoomba - A Most Unusual Cafe!